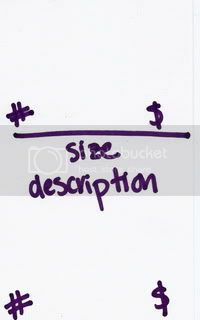 Please make sure that your tag has 2 sections, with your contributor number and price on EACH section. This ensures that every contributor is credited the correct amount! Placing your contributor number only on the top of the tag makes checkout very difficult and slows it down for everyone else! This season Saturday, March 9, 2019 will be a discount day! We will host the sale at the Cullman County Fairgrounds Building 1. 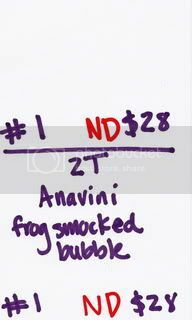 If you DO NOT want your items discounted 25%, you MUST put ND in red on your tag, to the left of the price! If ND is not on your tag, your item will be for sale at a 25% discount! Remember, people will come back on the discount day just to purchase discounted items! You may miss a chance for you item to sell if you do not discount it. Below is how your tag should be formatted if you do want your item discounted. 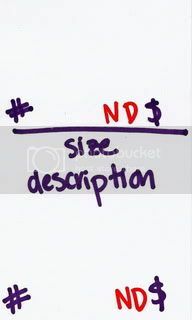 Below is how your tag should be formatted if you do not want your item discounted. 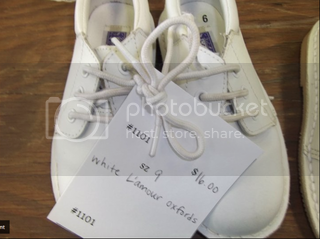 Below is an example tag of an item that is discounted. 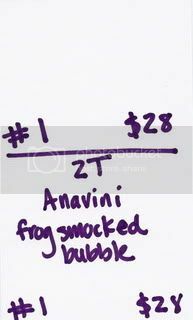 Below is an example tag of an item that is not discounted. You must use a wire hanger. They sell out fast in Cullman, so stock up now! Ask friends and family that have uniforms provided by their company to give you their left over wire hangers or check with local dry cleaners. Your hanger must face the left, like a question mark. 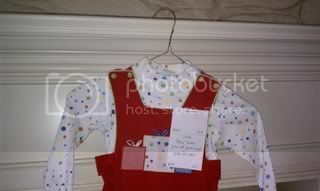 The tag will be pinned on the right side of the garment with a safety pin. Straight pins will not be accepted. All large toys and baby necessities should be clean and in working order. We will not accept dirty items or items that do not work. If it requires batteries, make sure they are working. Tags should be taped to the item if pinning is not possible. Please place all bedding in a large clear plastic bag.